What? 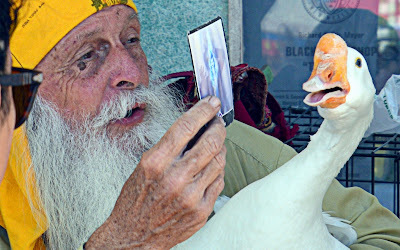 This guy just sits there and the goose, what, picks tarot cards? And the guy shows them to the goose and relates the corresponding prediction or whatever? Or is the goose picking cards for folks who approach too near? Or did the goose just wander into this guy's space and the guy spontaneously gave the goose a reading? Did they have anyone there displaying their walnut collection? 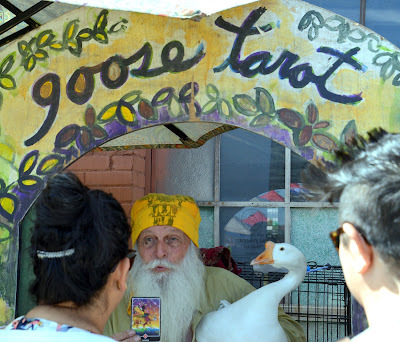 Unfortunately TSG can offer no enlightment regarding the Goose Tarot experience/process. My impression was that the guy was sort of a sideshow-esqe fixture of the farmer's market and people didn't take him too seriously. I'd bet he's probably a regular at the regional Renaissance Fairs.